At 5,895m, Mt. Kilimanjaro is one of the largest volcanoes ever to break through the Earth's crust. Your challenge is to reach its summit! Your trek starts in the rainforests of Lemosho Glades and heads upwards as you acclimatise on Shira Plateau. From here you will catch a glimpse of your goal, Kibo, Kilimanjaro's main ice-capped peak. 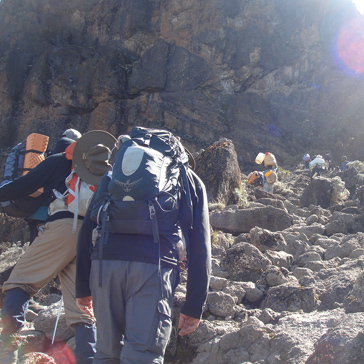 You continue via the beautiful Southern Flank, Barranco Wall and Barafu Route. Temperatures drop at night, allowing you to enjoy the crisp cool air under the star-studded African skies. During the days you'll rise higher; often looking down on a sea of clouds. The expedition has been carefully planned to ensure that you acclimatise as much as possible to the altitude and your chances of making it to the summit are maximised. Our operations team has one of the highest success rates of trekkers reaching the summit, but don't underestimate the challenge ahead. On the final night before the summit climb you shall need to rise at around midnight to commence the final trek in the moonlight up the scree slopes to Stella Point. Your aim is to reach this point by dawn and continue around the rim to the highest point, Uhuru Peak. This is likely to be the toughest day that most trekkers have ever experienced, involving 1,295m of ascent, 2,145m of descent, and 12-15 hours walking. You will connect with an internal flight to Kilimanjaro airport and then transfer to your hotel where you will enjoy a welcome lunch. This evening you will have your briefing and kit check. Overnight and dinner in a hotel. This morning you will register at the main gate of the National Park before being driven to Lemosho Glades (1,981m), where you start the 3-5hr trek through the rainforest to Big Tree Camp (2,800m). This is an unspoilt and exciting route, taking you into true wilderness. Your trek today will be along a little used track known as Chamber's Route. In places the vegetation is so undisturbed by humans that it grows right across the narrow track. The flora and fauna are richer here than on other, more-trodden routes through the rain forest. Dinner and overnight at Big Tree Camp (or nearby in the rain forest). Today is a full days trek with a height gain of over 600m, taking you to a lunch stop at a beautiful valley just outside the Shira Crater at around 3,050m. After lunch you cross into the Shira Caldera, a high altitude desert plateau. Shira is the third of Kilimanjaro's volcanic cones. It is filled with the lava flow from Kibo and its rim has eroded and been blasted away by weather and volcanic action. You will camp and have dinner at Shira One (3,500m). Today you can expect to experience your first close views of Kibo, the dramatic summit cone of Kilimanjaro! Approx trekking time 7-8 hrs. Today consists of a 5-6hr trek east across Shira Plateau to Shira Two via Shira Cathedral (3,880m). The views from the top of this ridge are spectacular, though those with vertigo should take care. Overnight dinner and camp at Shira Two which is located at around 3,800m. Today you will be crossing the Southern flank, passing down the Barranco Valley to the camp at Barranco Wall. Here you will camp and have dinner at 3,900m, the walk will have taken you to 4,440m and over the ridge or to 4,550m and over Lava Tower offering valuable altitude acclimatisation. 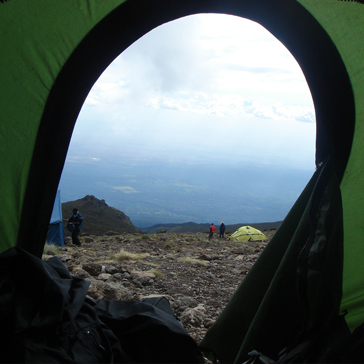 The camp at Barranco is one of the most spectacular on Kilimanjaro, with views of Mount Meru and the valleys below. Today's trek will take approximately 7-10hrs. Today is an acclimatization day at the Barranco Wall. Here you will camp and have dinner at 3,900m. The camp at Barranco is one of the most spectacular on Kilimanjaro, with views of Mount Meru and the valleys below. Early morning you will start with a climb up Barranco Wall (4,170m) with an immediate height gain of 200m to admire the views of Mount Meru and the plains far below. You will continue across the ridges and valleys to Karanga Camp at 3900m, where you will have lunch. This day should take approx 4-6hrs. In the afternoon there will be an important optional trek up the scree slopes towards the southern ice fields. Again, this acclimatisation walk is highly recommended, and will aid your chance of summit success. Overnight at the Karanga Camp. 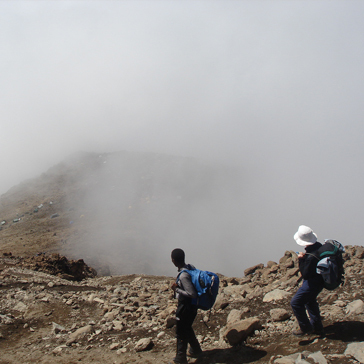 After breakfast you will trek up to Barafu Ridge Camp (4,600m). This 3-5hr trek is tough due to the altitude. You should reach the camp well ahead of most other climbers on this route because they will mainly be starting from further back at the Barranco Camp. Depending on your condition, you can either take an afternoon rest or a short acclimatisation walk to a higher point and then return. You will have an early dinner and rest until midnight, when you commence your push for the summit. You will need to rise at around midnight (if you've managed to get some sleep!) to commence the trek up the scree slopes to Stella Point, continuing around the rim to the highest point Uhuru Point. It can seem mild at first but as you reach the exposed ridges, wind chill causes the temperature to plummet. First light is apparent around 0530hrs and this really gives you hope to push on upwards. You should reach Stella Point (5,750m) on the crater rim just after dawn; then after a short rest continue for another hour or so round to Uhuru Point. 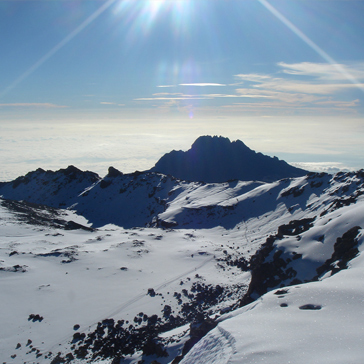 After reaching Kilimanjaro's summit (5,895m) and having enjoyed the amazing views, you will return via Stella Point. You descend the scree slopes via Barafu Ridge Camp for a few hours rest and then on to Millenium Camp (3,750m). This is likely to be the toughest day that most trekkers have ever experienced, involving 1,295m of ascent, 2,145m of descent, and 12-15hrs walking. It is, however, Victory Day! You will have a final camp meal and overnight at Millennium Camp. There is the possibility of a coke and a beer at this camp! Today you will start early and walk down through the beautiful rainforest to Mweka Gate. This is a long walk-off on a pretty, gently sloping track that takes you from the lower heath into the rainforest and finally down to the farms and plantations near Kidia. The path continues for 5-7hrs until you reach the gate for a picnic lunch, presentation of National Park certificates and triumphant photos. After lunch you will be driven to your hotel (approx 2hrs) for a well-appreciated shower and a large, celebratory dinner. You will have a few hours to relax in the hotel, to go shopping for gifts and souvenirs or alternatively arrange a short safari (at your own expense) before you transfer back to the airport and begin your journey back home. N.B. The itinerary is there as a guide and may change due to unusual weather patterns, wildlife movements, the strength of the group, and so on. We will do our very best to keep to the set itinerary; however we cannot be held responsible for any last minute changes that might occur. In all such circumstances, your expedition leader will have the final say. Should you suffer from vertigo, it is worth considering that on most mountain treks there will be occasional exposure to sheer drops. You should therefore discuss the particular itinerary of your choice with a member of our team.